Hello, hello my friends of the future world. Once again we meet on this WP platform, which has been wobbly from time to time. I’m sure you are ready for this week’s listing of prognostications of tomorrow and beyond. It includes bears, fiber, and of course a eyebrows. I hope you can endure it, cause I can’t cure it. Aries… The Moon is in Aries now and is feeling nauseous about it. That’s never a good sign. Soon, you won’t know the difference between the soup du jour and some old Ensure, but your taste buds will. Yuck. Taurus… Mercury is tri-congenital now against Taurus. That portends problems for you. One day, you will fall in love with a muffin top. You will double date with a Babka lover. Your friends and family will think you are weird and shun you. Gemini… Neptune is rising at a much slower rate than usual. That’s not good. Someday in the future, your life will be full of sunshine as you hurtle toward the sun. Ouch! Cancer… The Sun is in Astro projection and square with Cancer at this time. It foretells trouble for you. Someday, your lover will shower you with rose petals…after you’re thrown on a compost heap. Good luck with that. Leo… Mars is contra-square with Leo now. That’s never a good sign for a Leo. In the future, you will lose everything when you put all of your money into an “Earlobe Lock” investment. Virgo… Venus is waning now and whining about it. That will bring you trouble. In the future, you will eat so much fiber that one morning you will awaken to discover you have turned into a rope. You will become depressed, but cowboys will love to twirl you. Good luck with that. Libra… Saturn is juxta-polar position now. That foretells problems for you. Not long from now, you will find yourself in a fog bank. You will become depressed when you realize you aren’t earning interest on any of your deposits. Scorpio… The Earth is cross linked with Scorpio at this time. That’s never a good sign. One day you will be showered with hugs from a band of roving grizzly bears. Ouch! Sagittarius… Uranus is in non-objective tangentation to Sagittarius now. That spells trouble for you. In the future, you will write a bestselling book called, “How To Chant Your Way To Success”. Only a few Yoga instructors, and Dennis Miller will buy a copy. You will then chant your way into depression. Sorry. Capricorn… Jupiter is misaligned with Mars now and that isn’t good for you. Not long from now, you will awaken to find you have been transformed into an Iron-on patch fastened, on the rear end of a pair of pants, worn by a long haul truck driver. Yuck. Aquarius… Venus is on the cusp of Aquarius but semi-conjunctive. That’s a horrible sign. You will not be happy when an eyebrow tech, or a harpist plucks you. Ouch! Pisces… Pluto is back in court with its lawyer with a new petition to make it a planet again. It’s not going well. That’s bad for you. One day you will wake up with a permanent smile on your face. People will think you are devious. They will shun you. Good day, dear friends of prognostication. Another week has flown by the wayside. Here we are dishing up another plate of premonitions based on the latest Astro-illogical charts we could find. This weeks forecasts include actors, hairy fish, and of course a white rabbit. Aries… The Sun is in high triangulation with Aries at this time. That’s never a good sign. In the future, you will blame all that goes, or has gone wrong in your life on the Troglodytes and Dennis Miller. Your friends and family will get fed up with your ranting and abandon you. 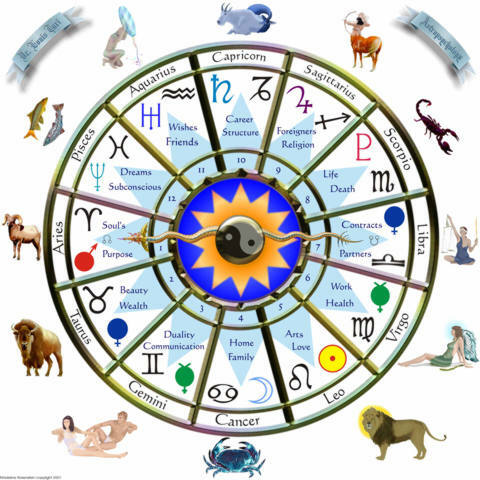 Taurus… Saturn is in its fourth house now feeding the tropical fish. One has died, and Saturn is upset since it was a favorite. That’s not good for you. In the future, you will spend lots of time and money attempting to grow hair on fish to keep them warm in cold waters. Gemini… The Moon is in low angular agitation now. That’s never good. In the not too distant future, you will have the compulsion to stalk either Goldie Hawn, or James LeBron. It could go either way. It won’t end well for you. Have money available to bond out of jail. Cancer… The Earth is nearing the cusp of Cancer but in juxta-conjunction to Mars. That spells trouble for you. In the future, you will develop a tendency to yawn while in the john. It won’t be pleasant. Leo… Mars is in retrograde and bipolar now. That’s not a good sign for you. Someday, you will awaken after being hypnotized to find yourself kitting a ham dinner for your family. It will have the taste and smell of wet wool. Sorry. Virgo… Mercury is destabilized at this time. That foretells problems for you. In the far future, a band of roving actors will stop you and demand to see your part. It won’t go well for you. Libra… Venus is tri-circumferent at this time. That portends trouble for you. In the somewhat distant future, you will awaken one morning with the secrets of the universe locked in your head, but you won’t remember the combination. Scorpio… Jupiter has shifted to a tri-genic orbit at this time. That’s never a good sign. In the future, you will survive a mine explosion without a scratch. But, you will be injured when you experience a mime explosion. Sorry about that. Sagittarius… Pluto is bipolar at this time. That’s never good for you. Be sure to have a towel with you at all times. In the future, you will bungle the bath of a bunny in a bungalow. It won’t end well. 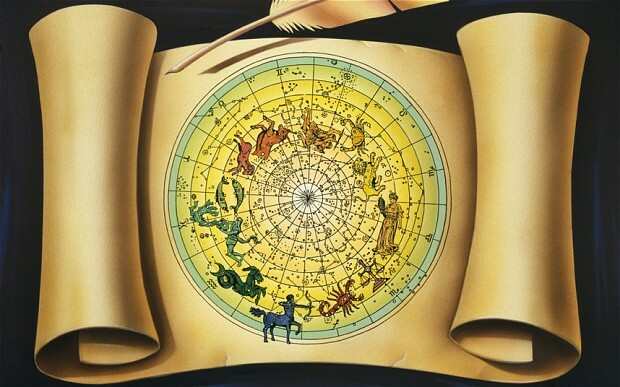 Capricorn… Uranus is triamenic to Capricorn at this time. That spells trouble for you. In the near future, you will encounter Yoda, or Yoyo Ma. It could go either way. In either case, one or the other will bring you bad news. Aquarius… Mars is adjacent to Aquarius but at an odd angle. That will bring you problems. In the distant future, our loved ones will worship the ground you walk on, but despise you. Sorry. Pisces… Saturn is trine with Pisces and in opposition to it. That spells trouble for you. In the future, you will have a case of pink eye just after you change into a white rabbit. We hope all is well with you at this time. If not, this week’s predictions will fall right into place for you. They involve Pit Bulls, Groucho Marx, and of curse a rotten rind. Aries… The Sun is in tri-modal position now. That’s not good. In the future, you will have the urge to return to the hospital where you were born and demand a refund on yourself. Taurus… Uranus is in juxtaposing to Taurus now. That spells trouble for you. In the future, you will have the urge to get even with someone by being odd. Gemini… Neptune is in dire need of therapy right now. That’s means trouble. In the future, you will write a bestselling book called, “Pit Bulls And Pierogis”. Only a few lonely Polish folks will buy a copy. You will not be happy about the whole thing. Cancer… The Moon is in half aspect now. That’s unfortunate. In the future, you will be involved in a chain reaction. Relax; it will only be a tarnishing event. But, your friends will eventually pawn you for a few dollars. Leo… Mars is in its fifth house now on an alcohol binge. That’s always bad. In the distant future, you will spend many months researching and writing a book called, “Gaucho, The Sixth Marx Brother, (Twin of Groucho)”. Virgo… Jupiter is aligned with Neptune now. Too bad for you. Someday, you will join a religious group. You will later blame all your misfortunes on your altar ego. Libra… Mercury is in its third house at this time suffering from an allergic reaction to space dust. That always foretells problems. In the distant future, you will spend many months researching and writing a book called, “Ear Wax Sculpture For Fun And Profit”. You will lose all when sales drop from two to zero. Depression will set in. Scorpio… The Earth is in its fourth house now and it’s on an eating binge. Hmmm. That’s never good. You will make millions with your book entitled, “Meandering for Fun and Profit”. Sagittarius… Venus is post-uranal at this time. That portends problems for you. Your enemies are secretly planning to flash freeze you, so bring a heavy jacket, and gloves. Capricorn… Saturn is rising now, but a bit too early in its orbit. That’s not good. One day in the future, you will make plans for a pouting party. Dennis Miller will be there. Aquarius… Pluto is in retrograde and on the cusp of Aquarius at this time. That’s never good. One day, you will be convinced that you must devise a way to attack a rotten rind from behind. Pisces… Mars is trine with Pisces now. That’s never good. Soon you will shout from the pain of gout while you are out and about. Sorry about that.